In 1980, the year of its birth, the independent Polish trade union – Solidarność (in English, “Solidarity”) – grew at a faster rate than any other union anywhere in the world before or since. It went from having no members to representing 9.5 million workers – one out of every three Poles of working age. Solidarność’s origins lay in the rapidly rising prices that were causing unrest across Poland. Nowhere was this more evident than in the massive Lenin shipyard in Gdansk, where workers led by the charismatic Lech Wałęsa, formed an organisation to challenge the officially recognised and communist-backed unions. Its distinctive red and white logo incorporating the name Solidarność and the Polish national flag soon became recognised well beyond Poland’s boundaries. The Polish government’s response to the growing unrest was to declare martial law and arrest many of the new union’s leaders. The rise of this new independent union initially caused difficulties for British unions that had long established links with the official unions in Eastern Europe, but soon it became clear that Solidarność was the authentic voice of Poland’s workers and the TUC and individual unions in the UK did all they could to provide practical support. The TUC raised tens of thousands of pounds and sent thirteen lorries of food (about 200 tons) which was distributed by the Polish Church Charity Commission. The wider union movement sent office equipment, printing and duplicating machinery and paper, and supported the growth of Solidarność by training its officials and organising twinning arrangements between British unions and Solidarność regions. 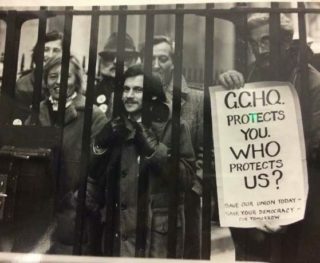 Lech Wałęsa came to London as the guest of the TUC and during that visit was also invited to Chequers by Prime Minister Margaret Thatcher – prompting many to note that Mrs Thatcher was happy to support trade unionism provided it was of the Polish variety. In the end, the government was forced to negotiate with Solidarność. The talks led to semi-free elections in 1989 and by the end of August, a Solidarity-led coalition government was formed. In December 1990, Lech Wałęsa was elected President of Poland. In 1983 he had been awarded the Nobel Peace Prize.